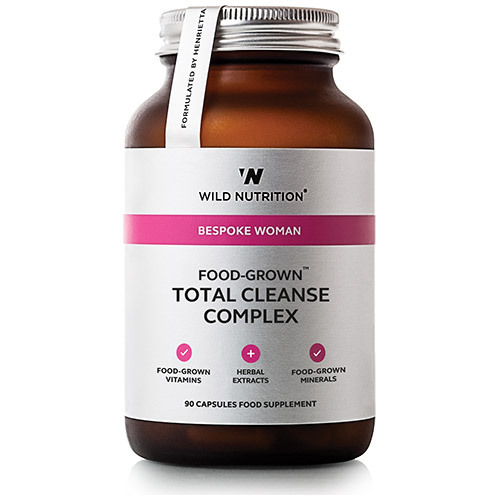 Wild Nutrition`s Food-Grown Total Cleanse Complex has been specifically designed for women and can be used to support a therapeutic approach to hormone balance, healthy weight and stress management. Uniquely formulated for women, a complex of Food-Grown vitamins and minerals, whole-food nutrients, amino acids and herbs. This product is the first stage of Henrietta’s ‘Total Cleanse Programme` - cleanse that works on the body`s biochemistry and cellular health, from the root up. Cleansing is an opportunity to recover from modern life and allow our body get back on a positive track by nourishing the body with key nutrients and revitalising foods. Vitamin C incorporated in citrus pulp. Mineral enhanced yeast providing Thiamin, Riboflavin, Vitamin B6, Vitamin B12, Niacin, GTF Chromium, L-methionine, Molybdenum and Choline. Lactobacillus bulgaricus combined with Magnesium. Folic Acid (as naturally occuring Folate) incorporated in Alfalfa concentrate. Apple Pectin, Artichoke Leaf extract, Beetroot powder, Burdock Root extract, Dandelion Root extract, Cordyceps Sinensis powder, Slippery Elm inner bark, N-Acetyl Cysteine. Vegetable Cellulose (capsule shell). Free From: Wheat, gluten-containing ingredients, soya, artificial colours, added sugars, flavourings & preservatives. This product is free of excipients. Contains no live yeast at time of manufacture. We advise taking your supplements a minimum of 2 hours from the time of taking any medication. Below are reviews of Wild Nutrition Total Cleanse Complex - 90 Capsules by bodykind customers. If you have tried this product we'd love to hear what you think so please leave a review.